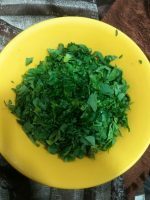 I love fresh Methi or Fenugreek leaves. Methi Paratha is an absolute favorite breakfast during winters at my home. I mean come on do we Indian need be told about bow to make ‘parathas’, we’ve been making (or having) one or the other variety of Parathas for breakfast each day. Moreover after i learned the health benefits of methi leaves from my father, my fridge has a dedicated section for it. Basically it helps to control diabetes, cholesterol level, improves heart health and cures constipation and join pain. 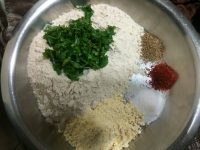 Methi paratha can be made easily. Bunches of fresh methi are very sandy and must be washed thoroughly under water before using them. Once cleaned – cut off the roots, separate the leaves and discard the stems. 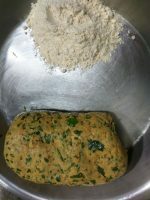 Combine coarsely chop methi leaves, with flours, spices and knead it into a soft pliable dough. Mix All Ingredients together. Slowly add water and start working on the dough. Do not pour all the water at once. You may need more or less water depending on how thick or liquidy your curd was. Once the dough starts to bind together add water very slowly. Finish the dough up by adding 1 tablespoon of oil and form it into a smooth round ball. Dough is ready. Let’s begin rolling our parathas. Make golf size balls out of the kneaded dough. Roll them in dry wheat flour. Lay it flat on a platform. Before we start shaping the ball, heat a tawa or griddle over medium heat. Use a rolling pin to roll the dough out into a larger circle. Transfer rolled out paratha onto the heated griddle. Cook from one side and flip. Apply butter and using a spatula cook from that side. Flip and apply oil on the uncooked side, spread it over the paratha, press and cook until brown and fully cooked. Transfer it onto a plate and repeat the process with the remaining dough. Serve them hot with coriander chutney and Garlic chutney..
1) Firstly, to make soft paratha also add 3 tbsp of besan while preparing dough. 2)Methi paratha stays fresh for longer time when kneaded only with curd and not water. 3)Additionally add finely chopped onions and green chili, to make it more flavorful. 4)Finally, methi paratha is very healthy and good for digestion.